With the young generations of today becoming more and more engrossed with their phones, it is no wonder that 660,000 drivers attempt to use their phones while driving. We’ve all seen those drivers: phone in one hand, steering wheel in the other, eyes rapidly moving between the phone and the road, giving the driver the notion they will not get in an accident. Unfortunately, this image has become more and more common over the past couple years. Currently, 46 states, Washington D.C., Puerto Rico, Guam and the U.S. Virgin Islands have outlawed texting for all drivers. But this does not stop the 1.6 million texting and driving accidents per year that occur because of cell phone use while driving. We know it seems unlikely at the time; you think you’re only looking away from the road for a total of five seconds. You just want to send out that text letting someone know how far you are. But those five seconds, at about 55 mph, is long enough to travel the length of a football field. And if that football field suddenly comes to a halt, you’re the last one to know because you were too busy looking at your phone. The most likely generation to use their cell phone while driving is the teenager generation. 35 percent of teens admit to texting while driving, even though the know the dangers that are associated with it. This leads 21 percent of teen drivers to be involved in fatal accidents because they were distracted by their phones. Because of that hilarious video your friend sent you that you just had to watch while driving down the highway, you not only put yourself in harms way, but also whoever you hit with your car. Not to mention when teens have company in the car. A teen driver with only one additional passenger doubles the risk of getting into a fatal car accident. With two or more, the risk increases the five times as likely. While sending a text is 23 times more likely to cause an accident, other cell phone related activities also increase your risk. Dialing the phone increases risk by 2.8 and even just reaching for the device increases risk by 1.4. Parents, this is not just their fault. 48 percent of young drivers said they had seen their parents drive while talking on a cell phone. 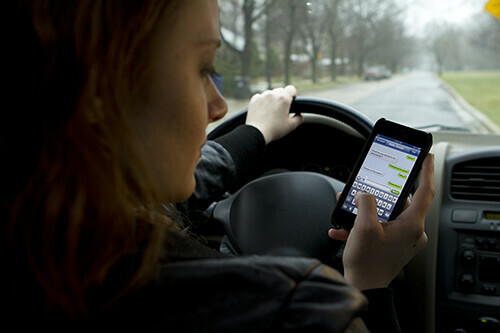 15 percent say they saw their parents text and drive as well. Every driver is going to be an influence on those younger than them in a car, whether it be a child, a friend or a sibling. It is up to us to focus on the road and keeping not just ourselves, but also those around us safe. If you have been involved in a texting and driving accident, there are lawyers who can help. A texting and driving accident lawyer at de Lachica Law Firm is prepared to force distracted drivers, who have injured others with their recklessness, to be held accountable for their actions. Regardless if you need compensation for chronic pain, lost wages or rehabilitation costs, de Lachica Law Firm is dedicated to getting you exactly what you deserve. Contact de Lachica Law Firm today.